A toaster gives yummy taste to plain bread. Toasts are versatile, delicious, and completely perfect snacks for breakfast or any meal that can be taken any time. Toast can be made by using any kind of bread in the toaster, in the oven, or over a fire. a) First of all, put your slices of bread into the slots of toaster carefully. Also, cut off the extra parts of bread if the slices are too big to fit in the slots. The sides of the toast should not rub against the heat coils as the ends will burn and stink up the kitchen. b) Then, choose the setting for the level of darkness of the toast you want. Set the knob higher or lower accordingly. It is recommended to start toasting at low so as to avoid burning your toast. c) Finally, push the button to toast the bread. You should keep an eye on the toaster so as to make sure it doesn’t burn. 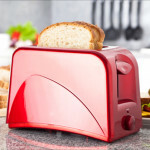 After your toasts get ready, remove the hot toast from the toaster carefully. If toaster is op-up toaster then toast will automatically pop out from toaster when toasts get ready. a) Put the slices of bread on the oven rack. 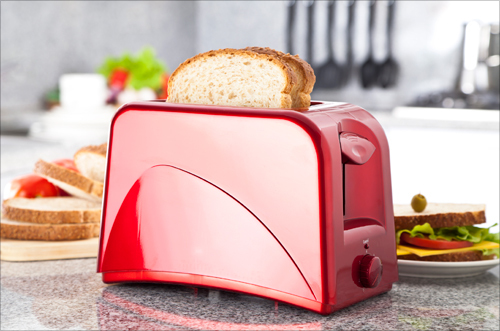 The best way to evenly toast bread is using a convection oven or a toaster oven. Move the oven rack to the highest possible position in the oven to make toast in an efficient way. b) Then, turn on the broiler of the oven, or set the heat on the toaster oven. The broiler heats the top of the oven only which is the quickest way to make toast but at the same time, it can also burn quickly. So once you’ve set your desired temperature, you need to keep an eye on the bread. It is better to buy a toaster oven as it has a timer that will turn off the oven at the appropriate time. c) You can use tongs to flip the bread while toasting. When you observe that the top of the bread turns brown, flip the bread so that other side if it comes over to toast. d) Now, after your toast gets ready, remove it from the oven. a) Put bread flat in a skillet. If you want even toasting then choose cast-iron skillet with no butter or oil to grease it. Just put your bread into the pan dry and let the heat toast the bread. You can fry your toast in a little butter or oil to crisp it up and give it a golden crust. This is sometimes known as Texas toast and it is delicious in taste. b) Now, heat a skillet over medium-high heat. When your bread is in, simply heat the skillet and toast it in the pan. Also, watch your bread while toasting to avoid any kind of burning. c) Flip the bread over periodically by using tongs or a turner. Flip your bread on the other side when its underside is done and start toasting the other side. There are many other ways of toasting bread, you can search internet to know more regarding some other ways.